Katherine and David Keith have been raised by their uncle, Henry McFarlane. Katherine is leaving for the Far East for relief work. She and David meet John Ralston, a mail clerk on the Arizona Express who helps Katherine get on the train at the last minutes as it is pulling out. David has a good job at this uncle's bank, but he is involved with Madeline, a dance at the Los Toros Café. McFarlane disapproves of this relationship and tells David so, but David does not take his advice. McFarlane goes to Madeline apartment of confront her and encounters her criminal boyfriend, Victor Johnson who kills McFarlane. David is framed for the murder and is sentence to die. David gets caught up accidentally in a jailbreak and, he jumps aboard the Arizona Express to get back home. He gets on the mail car and is helped by John to get some new clothes and disembark the train unseen. Wounded and tired, he arrives at Florence Brown's house, a neighbor of he family who has been secretly in love with David. Katherine arrives home from the Far East, and Florence brings her to David. After he tells her his story, Katherine determines to infiltrate Johnson and Madeline's gang to get proof of David's innocence. She gets invited to a party the gang is having and is able to get away with a letter in which Johnson admits to the killing. David has been recaptured by the police and will be executed at 8 a.m. the next morning if she doesn't arrive at the Governor's home with the letter. Her only hope of arriving on time is the Arizona Express. With the gang in pursuit, John is her only hope of getting the help she needs. Regular readers of Silents Are Golden's Features of the Month know that we occasionally veer away from the mainstream films that are available on DVD's in pristine condition with newly recorded scores. It would be a disservice to readers who may not have an extensive knowledge of the silent era to imply - by virtue of their exclusion - that there are not a lot of other very enjoyable and entertaining silent films in circulation, as well, albeit most with "pieced together" musical scores (some pretty good and some awful) and sometimes "not so good," picture quality. To cut to the chase, "Arizona Express" is highly recommended for viewing, but the only copy that appears to be available in general circulation is maybe average or a little better on picture quality and scored as well as could be expected from pre-recorded music sources - really not bad. In spite of those shortcomings, the film should not be missed because of what it DOES have to offer - a strong cast, a better than average story, and lots of action. The April 23, 1924 Variety reviewer said, "The name 'Arizona Express' is an unfortunate selection, sounding like a 'western,' and the picture is far removed from the average of that category." The reviewer is right on target - this picture is "far removed" in quality from the average western we see during this and the next couple of decades. No, this is not a western, but, as the film states at the opening, "an honest melodrama" taking place in contemporary (that is, 1924) times. 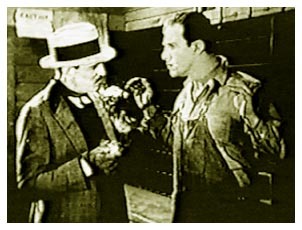 To give the reader some point of reference, the "gangster" component of the film reminds one of Priscilla Dean's and Lon Chaney's "Outside the Law" (1921) combined with the action of one of the Helen Holmes railroad pictures ("The Open Switch" - 1926, "The Lost Express" - 1926, for example), but much more exciting and better quality than the Holmes' films. The film was produced by the Fox studios, and the story is not performed by a lightweight cast. Pauline Starke, Harold Goodwin, David Butler and Evelyn Brent are all respected names in the silent cinema and bring strength, emotion and quality to the story. Although Starke is given top billing, the first half of the picture is almost all Goodwin, and he handles it well. As a matter of fact, Variety went on to say, "Butler and Miss Starke both do well, but they must surrender honors to Harold Goodwin as the brother and Evelyn Bent as the dancer, two remarkably good performances." Once again the reviewer is on target, especially in regards to Goodwin's performance. Goodwin portrays David Keith, Katherine's (Pauline Starke) younger brother. It's the age-old story of the boy who has a cute neighbor, Florence (Ann Cornwall - remember, she and Goodwin appeared with Buster Keaton in "College" - 1927) who's in love with him, but he prefers the more mature, and attractive - not to mention, seductive - woman who is using him for her own gains. In this case it's Evelyn Brent who portrays Madeline, the dancer at the Los Toros Café, who, unbeknownst to David, is the girlfriend of gangster Victor Johnson (Francis McDonald), who an intertitle tells us is "well-known to police on three continents." She's using David to get the layout of his uncle's bank for Johnson. David has taken Madeline back to her hotel and says goodnight. What he doesn't know is that Victor Johnson is waiting inside the apartment for Madeline, and she's overjoyed to see her boyfriend. She shares with him a drawing of the inside of the bank that she was able to create after visiting the bank with David. It's pouring rain outside, and just as David rounds the corner to leave, he sees a taxi drop his uncle off at the hotel. The uncle gets the room number from the clerk, goes upstairs and knocks on Madeline's door. Madeline and Victor stand motionless and wait to see if the unknown visitor will leave. David slips into the lobby downstairs, afraid, and takes a seat. The uncle gets no answer, so he tries the door, and it opens. There stand Madeline and Victor. He steps inside the apartment and lays his hat on the table next to the door. "What is your motive for leading on my nephew?" he demands. "I don't think that's any of your business," Madeline says defiantly. Seeing that he will get nowhere with this woman, he takes his hat and turns to leave. Then he notices the drawing of the bank on the table. Suddenly he realizes the type of people he is dealing with. Alarmed, he darts from the room, but Johnson grabs him in the hallway. They scuffle, but Johnson is able to get the uncle back in the room where he hits him over the head with a candelabra. Realizing the door has no lock on it, Johnson places a chair against the doorknob. He then tells Madeline to pack quickly so they can escape. In the bedroom, Madeline's small dog gets in the way, and Johnson grabs him by the scruff of the neck and tosses him to one side. David can wait no longer and goes upstairs. He pushes lightly against the door. The chair prevents it from moving. On the inside, however, we see the chair slip down to the floor. Johnson grabs the candelabra again and waits for the intruder. Suddenly, a burst of lightning knocks out the power, and the building goes dark. David pushes once more, the door opens, and he steps inside. Through flashes of lightning, we see hands scuffling with one another, then an occasional outline of a figure in the darkness. The fight continues although we only catch glimpses of the altercation thanks to the lightning flashes. Suddenly, we see two silhouettes, one raising something in his hand and coming down on the other just as the room goes dark again. Johnson is then shown leaving by the fire escape, holding his arm, obviously hurt. In the lobby, the clerk and another man see the dog come down the stairs. When one of them pets the dog, he gets blood on his hands. The two men decide to investigate. They walk into Madeline's room carrying a light. There stands David holding a candelabrum. Lying on the floor is his uncle - dead. Madeline cries, "It was your uncle - you've -" and with that, David faints. Very dramatic stuff, and a dilemma has been created that tests our deductive and predictive abilities (we love that stuff!) to the max! Not only is David caught with the "smoking gun," so to speak, because of the darkness, he thinks he actually committed the crime and killed his uncle. What makes "Arizona Express" such an enjoyable film to watch is that is never slows down. We've just sat through a harrowing sequence that has us wiping our brow and saying, "Whew!" just as another "slam-bang" sequence is about to begin. A friend of the family, Judge Ashton, has come to visit David, but he has bad news - there is no hope for help from the Governor. As the Judge leaves, David sits down in the visitors' area with his head in his hands. Suddenly, a prison break erupts, and David is caught in the middle. Worthy of a battle scene in most war pictures, "all hell breaks loose" as hundreds of inmates pour out, pushing, shoving and running into the yard. A guard is shot, and the guards begin shooting at the prisoners. Someone on the outside is in on the plan and runs several railroad cars of stones from the local quarry through the wall of the prison yard. David and another inmate run from the prison with a guard in pursuit. David is hit in the shoulder but is helped to his feet by the other inmate. As they run, the inmate is finally shot and killed, but David is able to get away. The prison break is well staged and not cheaply done. The prison is very believable, the railroad cars ramming the wall is thrilling, and the shooting, fighting and general melee of the escape is nail-biting cinema. As can be seen, Goodwin has been the central character for much of the first half of the movie. He carries it well portraying the young bank executive with class, the enamored young paramour with innocence, the distraught convict who has killed his uncle and ruined his life with emotional intensity, and the prison escapee with excitement. Starke (that is, Katherine), remember, left at the beginning of the movie to do relief work in the Far East. Although receiving top billing, she doesn't return to the picture until well over 40 minutes of the story has elapsed. She is, however, in the truest sense of the word, the heroine - because it is she who rescues her brother from the electric chair. Katherine must infiltrate Victor Johnson's gang and somehow get proof that David did not kill his uncle. Keeping in mind the character established for Starke at the beginning - basically a missionary - she must now play the part of a "moll." Pauline Starke was one of the most attractive stars of the silent screen. It's easy to see why the men in the gang stand up and take notice when she knocks on their door as a neighboring tenant wanting an aspirin for a headache. The gang has a party going on consisting of Madeline, another "moll," and three men. Katherine takes advantage of the invitation to join the party, and, through a series of events, is able to secure a letter that proves David's innocence and Johnson's guilt. This sets the stage for the rest of the movie, a series of events that rivals Harold Lloyd's final sequence in "Girl Shy" (1924) for excitement and imagination. Realizing what has happened, the gang takes off in hot pursuit of Katherine who must get the letter to the Governor before eight o'clock the next morning - the hour set for her brother's execution. It appears that David Butler is absent from this story. However, he has emerged at key points in the film. As John Ralston, a mail clerk on the Arizona Express, he helps Katherine catch her train at the beginning of the story. She is on her way to the Far East, is late arriving at the station, and makes the train only when John offers a helping hand from the mail car. John is also able to meet David at this time, although only very briefly. The brief meeting of David and John is important for the next time they meet - after David's prison escape. Wounded and tired, David is able to climb aboard the Arizona Express and it moves slowly across the sandy plain. He weakly knocks at the door of the mail car, and John pulls him in. Remembering him from the day he met Katherine, John provides David some clothes to replace his prison garb and drops him off as the train slows down to enter the next town. We don't see John again until the gang's pursuit of Katherine begins. After an exciting car chase, she makes it to the train ahead of the crooks. Once again, she must catch the train as it pulls away from the station, and John pulls her aboard. For the next 20 minutes, we see John fighting gangsters in the mail car, John and a gangster hanging outside the mail car down in a death struggle as the train rounds perilous mountain curves, men jumping from a racing car onto the train, great stunt work as one of the gang jumps from atop a tunnel entrance onto the train, a runaway train racing down the mountain, John fighting four men in the car as Katherine jumps out with the note, Johnson chasing Katherine on horseback, the gangster's car crashing down the mountainside into the path of the train, the derailed train crumbling over the side of the mountain - and this continues nearly non-stop for over 20 minutes of the film's running time! When the end comes, the viewer is exhausted! 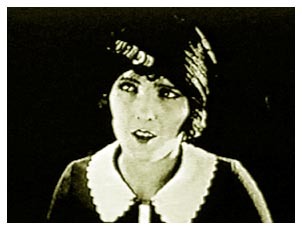 Called "a great actress" by Cecil B. DeMille, Starke started acting as an extra in her early 'teens. At 15 years old, she was cast by D.W. Griffith as an extra in "The Birth of a Nation" (1915) and then as one of the harem in "Intolerance" (1916). She continued to work for the Fine Arts company, not directed by Griffith, but in films that were supervised by the Great Man. Most often cast in melodramas ("Eyes of Youth" - 1919 with Clara Kimball Young and Rudolph Valentino, "Salvation Nell" - 1921, "The Little Church Around the Corner" 1923 with Claire Windsor and Kenneth Harlan, and "Sun Up" - 1925 with Conrad Nagel) Starke enjoyed both starring roles in many films but was often seen in the second female lead, as well. At 5'3" and only 109 pounds with dark hair, glistening eyes and a small mouth, Starke was often compared to Gloria Swanson. Although she never attained the popularity of the mega-star, Starke always felt the resemblance was a help to her career rather than a hindrance. She only made a few films after the silent era, but a second marriage in 1932 to theatrical producer George Sherwood lasted happily until her death in 1977. Butler's good looks and strong build (six feet tall, 185 pounds with black hair and blue eyes) made him a good leading man, but he never really caught on during the silent era to attain first echelon star status. Like Starke, he worked in "Birth of a Nation" and "Intolerance" as an extra, and also had parts in other Griffith features such as "The Greatest Thing in Life" (1918) and "The Girl Who Stayed at Home" (1919). He does a satisfying job in the films which are still available for viewing. 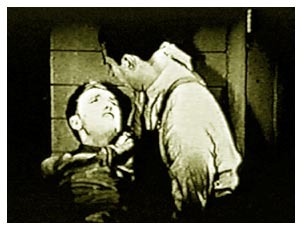 For example, he completely overshadows the bland John Bower's in King Vidor's "The Sky Pilot" as the adversary-turned-friend to Bower's minister character. (As an early Colleen Moore vehicle, this film is of particular interest) Also, as Charles Farrell's buddy in "Seventh Heaven" (1927), he does a commendable job as a fun-loving and upbeat Frenchman. Butler's career as an actor did not see nearly as much success as his career during the sound era as a director - a few Shirley Temple films, several dramas, comedies and musicals from the 1930's through the 1950's (over 60 films), and many popular TV shows such as "Wagon Train," "Twilight Zone," "Leave It to Beaver," "The Patty Duke Show" and more. He also produced and wrote films, as well. He died in 1979 at the age of 83. Harold Goodwin never achieved star status, but his acting credits are numerous, if not outstanding, with nearly 250 appearances in movies and TV shows over a 58-year career. Goodwin brought whatever a role required to full fore whether a troubled youth, a good friend, he cocky college jock, or a cowboy. Two of his most recognizable roles are as Buster Keaton's nemesis in both "College" (1927) and "The Cameraman" (1929). Goodwin also did stunt work in a number of films. Goodwin passed away in 1987 at the age of 85. Evelyn Brent began her 120-plus film career in 1914 at the age of 15 using her real name, Betty Riggs. She changed to Evelyn Brent in 1916. During the 'teens she worked steadily but not with great success. In 1920, she went to England and spent three years making films there, in the Netherlands and Spain. Her career was much more successful the second time around when she returned to Hollywood almost always being cast as the other woman, the villainess, a gangster's moll, or the tough girl. She is cast perfectly in "Arizona Express," but can also be seen contributed her superb talents to such surviving silents as "Underworld" (1927) as a gangster's moll and "The Last Command" (1928) as a Russian spy. Brent continued to act until 1950. She died in 1975. Harrison's Report (March 22, 1924) said, ". . . there is so much thrilling action in it that picture-goers who are not critical about logic will enjoy it to their heart's content. There is good human interest in it, too -- enough to satisfy almost everybody." Variety said, "Chalk one up for Fox. 'Arizona Express' is pointed directly at the box office, and its aim is sure. Furthermore, in spite of an excess of physical thrills in the last reel, it is a neat job throughout, and in spite of its 76 minutes, it never drags. In fact, there are moments when the picture "gets" one, even though the obvious intention was to turn out a good action film. . . The story is not the outstanding quality of the picture, but rather it is the masterful handling of most of he various incidents." Variety praised the movie's direction, too. "The entire picture is a credit to Thomas Buckingham, the director. Even at the end when the old, hackneyed situation of staying the electrocution of the boy a the last minute comes up, he shows artistry and originality." "Arizona Express" may not be everyone's cup of tea, but for anyone who likes non-stop action and tense melodrama, this film's got it all. Copyright 2007 by Tim Lussier. All rights reserved.